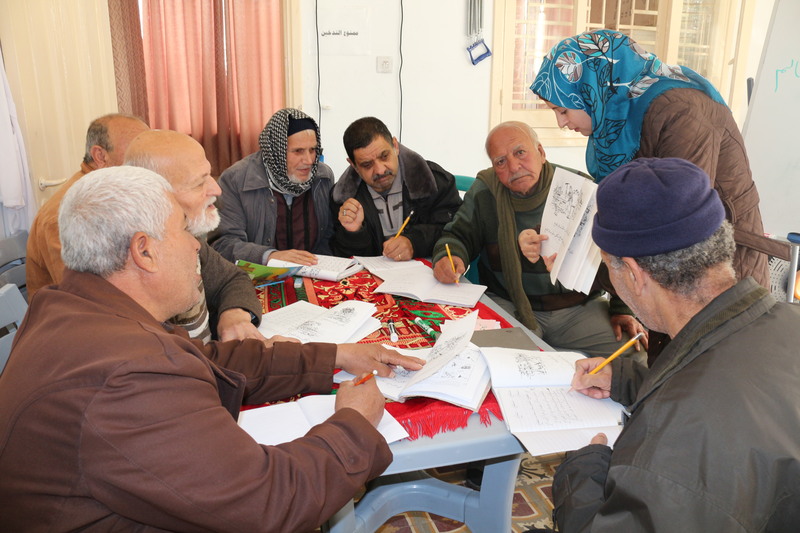 Sarah Gillam, Media Relations Manager for HelpAge International, visited one of our projects in Gaza – a day centre in Gaza City – to see how older people are being helped 6 months after Age International and the DEC launched crisis appeals. We pull up alongside a wall decorated with paintings of older people holding banners and calling into megaphones. We go through the gate and despite the early hour there are lots of elderly people about. Nearly twenty older men are congregating in the garden and there are about the same number inside in a meeting. We are introduced and settle down to chat outside in the garden. But it’s difficult. People are so desperate to talk. Eventually Anwar Harar, 69, is selected to speak for all of them. A friendly man with silver grey cropped hair he tells me his story. And it’s the same tale that I’ve heard interviewing people across the Strip. They, along with 100,000 others have been bombed out of their homes. They’re living with relatives or renting apartments. They’re running out of the money UNWRA has given them for five month’s worth of rent and most have no income. Their landlords are asking them to pay up or move on. They all have skills and are variously plumbers, heating engineers, teachers. Some speak good English, some do not. Many cannot read or write. Most are registered refugees. Most have lost everything. They fled homes in what they were wearing. 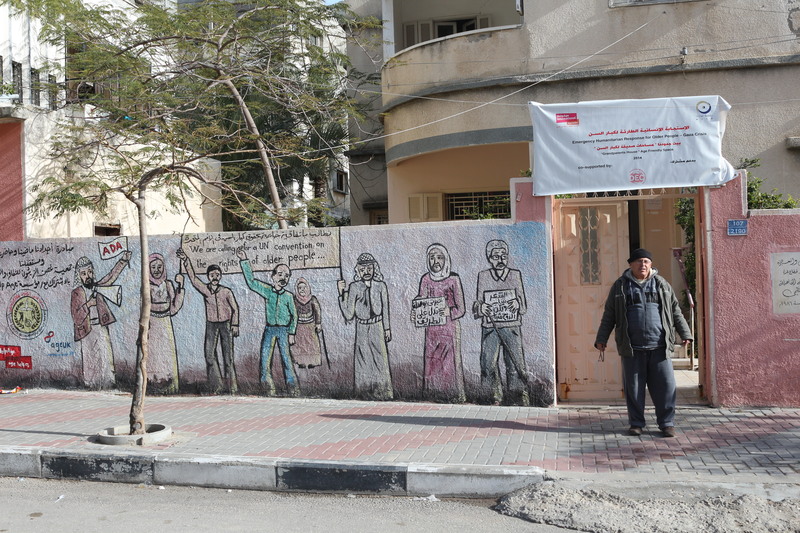 Age International’s Gaza City day centre for older people. I have to agree with him. The facilities, the house and garden seem like an oasis after zigzagging across the damaged Gaza Strip. It provides a space for older people to come together. Men and women meet on alternate days and they cater for 420 people six days a week funded by the UK’s Department for International Development, the Disaster Emergency Committee and Age International. Activities include going to the city gardens and enjoying time together. ‘There are many competitions. We come three days a week on Sundays, Tuesdays and Thursdays. And the women come on Saturdays, Mondays and Wednesdays,’ he said. 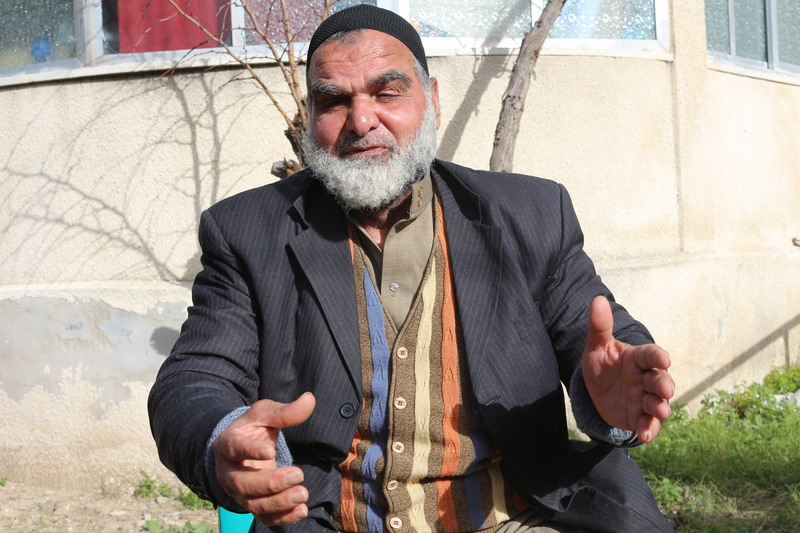 Talal Abu Kweik, 63, from Eled city tells me the worst thing is not having any income. ‘We have to have a monthly pension. We want to have the things that other people in the world have. We need dignity for older people,’ he said. Having talked to people individually in places across the Gaza Strip, I couldn’t help but agree with him. Older people were all suffering in similar ways but some people’s isolation was more marked than others. As well as being cold, homeless, without any income and short of food, the social isolation was making them depressed and downcast. 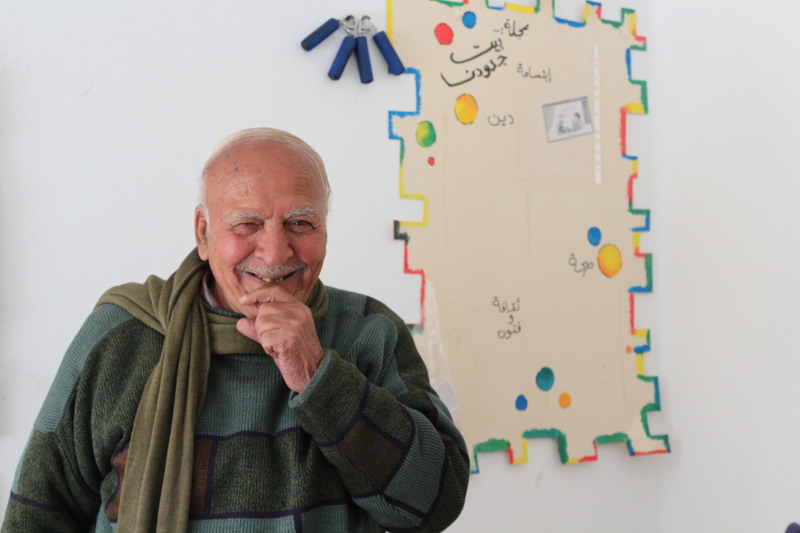 Talal Abu makes breakfast at the age friendly space. 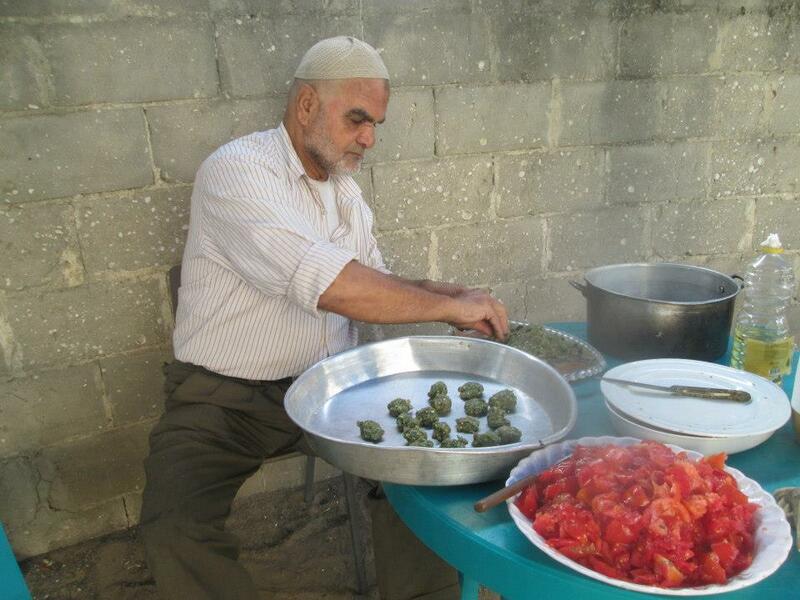 Day centres like this across the whole of Gaza would provide a way of people coming together. One woman I’d spoken to earlier had positively lit up when she talked about coming to the centre and she yearned to come again. The project coordinator Monzer El Masri, 26, said they had counselling sessions every week for people both individually and in groups. ‘We have a lot of social activities, such as celebrating people’s birthdays, going to parks on trips, providing hot meals. I just hope they get what they want – it seems so little that they are asking for.